Many summer mornings in Rocky Mountain National Park will dawn with beautiful clear bluebird skies that Colorado is so well known for. As a landscape photographer I'm always looking for the opposite conditions. Dramatic lighting and weather are my favorite conditions to to photographing Rocky Mountain National Park in. This morning rain was falling in Estes Park. 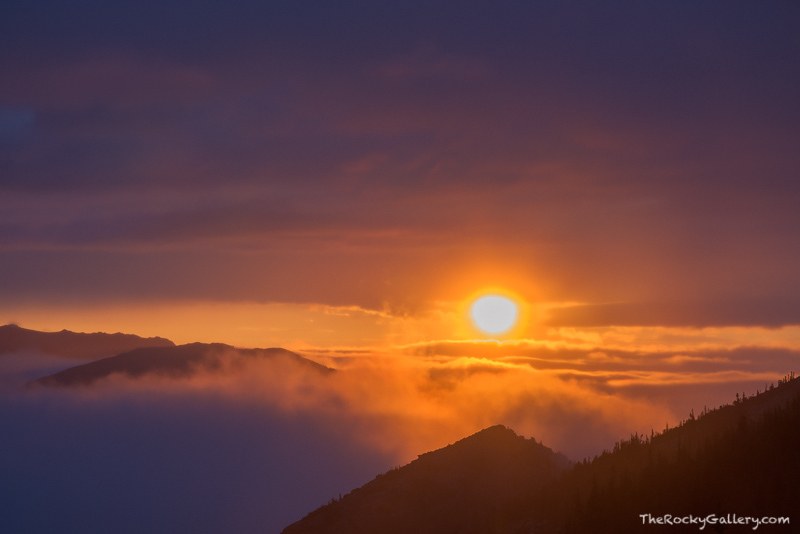 I headed up on Trail Ridge Road to the Ute Trail area hoping to possibly get above the rain and clouds for sunrise. There was a tiny slot in the clouds to the east and for just a few moments the rising sun broke through and cast the most beautiful glow on the landscape. Photo © copyright by Thomas Mangan.